Candidates must be 21-35 years old at the time of applying. Candidates must have a Bachelor’s degree in any academic discipline. Candidates must be proficient in reading, writing and speaking both Hindi and English, as their work would require analyzing government documents, guidelines, and circulars in both languages. Candidates must demonstrate advanced analytical skills, problem-solving abilities, experience of working in teams, and ability to work with diverse stakeholders. Candidates must be Indian citizens or hold a PIO/OCI status. Candidates with superior academic performance will be given extra weightage. Candidates with prior work experience in public service and development sector, especially governments, will be preferred. Candidates with Advanced degrees (Masters and above) may be preferred for certain positions. Online Application: The first round of shortlisting will be done based on academic and professional qualifications of the applicants, and their responses to personal statement questions in the online application. Candidates will be evaluated on criteria such as leadership qualities, achievement orientation and motivation. Only short-listed candidates will be contacted for the final round. Interview: The final round will consist of a face-to-face interview with a panel comprising officials from the GNCTD and external experts. Candidates will be interviewed in-person in Delhi. However, in exceptional cases, video conferencing may be provided as an option but only in rarest cases. There is growing demand among young, talented professionals across several disciplines to work and catalyze change from within the government. However, few opportunities exist currently that allow these young professionals with a passion for public service to contribute in a meaningful way. The Delhi Chief Minister’s Urban Leaders Fellowship program aims to provide a unique opportunity to young leaders across India to work within the State government to address some of the most pressing urban challenges, thereby creating a pipeline of change agents to support the vision of the Delhi Government. Who are the major stakeholders involved in managing the Fellowship program? The Fellowship program will be managed by a nodal officer (Secretary / Director or Advisor, GNCTD) working closely with the Chief Minister’s Office, Administrative Reforms department and participating line departments of GNCTD, and external partners to oversee smooth functioning of the program. Swaniti Initiative, an organization working in the governance sector, is the institutional partner of the program. It is overseeing several processes associated with managing the Fellowship program such as recruitment process support, induction training, ongoing performance reviews etc. What qualities are expected from the fellows? Fellows will be expected to bring to the table problem solving skills and a keen interest in public service. Over the course of the fellowship, fellows will be required to support the vision of the concerned government departments. Fellows will be expected to showcase leadership potential at different stages of the fellowship, as they will have to perform under challenging circumstances. Fellows will also be required to showcase entrepreneurial qualities when it comes to catalysing solutions for developmental bottlenecks identified by the government. What is the tenure of the Fellowship? The Fellowship program requires a commitment of one or two years to allow talented, experienced professionals to contribute meaningfully to key reforms – from design to execution. What is the total number of seats available in the Fellowship? Approximately 30 seats will be available in the Fellowship program in 2016. As a Fellow, who will I report to? Fellows will work directly under the supervision of senior officials (Secretary/Director level or Advisors to GNCTD), who will also provide regular guidance and mentorship on the Fellowship Assignment. In addition, high-level reviews of each Fellowship Assignment will be taken by the Hon’ble Chief Minister/Deputy Chief Minister every three months. What kinds of projects will the Fellows work on? Typical project assignments will require Fellows to contribute through a variety of roles over 1-2 years such as due-diligence and background preparation to launch an ambitious reform, project management to fast-track implementation of priority projects, providing ground-up feedback to ministers/secretaries on progress of key programs, strengthen concurrent monitoring & evaluation in key programs etc. While each Fellow will receive a specific assignment at the start of the Fellowship program, it is expected that they will also contribute to other ongoing activities and initiatives of the department, as needed. What deliverables are Fellows responsible for? Based on the activities assigned by their supervisors, the Fellows will be required to produce several outputs (project notes, reports, presentations etc.) through the Fellowship program. The Fellows will also be required to make regular presentations to concerned stakeholders and update them on the projects. What will be the remuneration provided to Fellows? 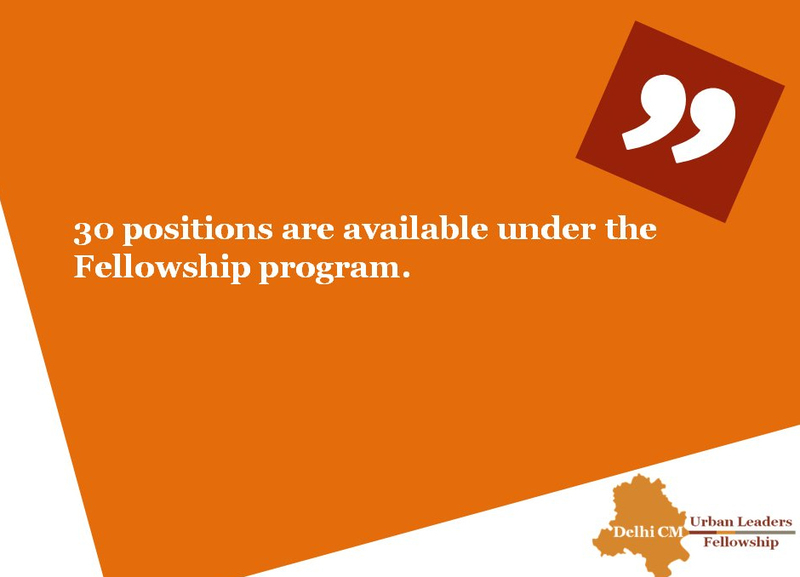 The Delhi Chief Minster’s Urban Leaders Fellowship Program would provide competitive remuneration given the length of commitment and cost of living in Delhi. Fellows will be entitled to a remuneration of UPTO Rs. 1,25,000 per month depending on their academic, professional and work experience. The fellows would also be provided a laptop / desktop computer to work on. What qualifications are you looking for in Fellows? Is there a provision of training of fellows? Training (1 week): Fellows will be trained on government processes and functioning, effective communication, leadership and conflict resolution, project ownership, working with communities, monitoring and evaluation etc. through lectures and interactive sessions with senior officials/ministers of the Delhi government, and subject matter experts from academia and civil society. Field immersion (2-3 weeks): Fellows will spend focused time on the field experiencing the day-to-day functioning of the departments they have been assigned to and forming their own impressions of the field-level challenges, and possible solutions. They will prepare a policy note summarizing their analysis of the challenges, and recommendations. Furthermore, ongoing follow-up training sessions will be scheduled during the course of the fellowship as well. Is there a provision for mentorship of fellows? All Fellows will work directly under the supervision of senior officials (Secretary/Director level) or Advisors to GNCTD, who will also provide regular guidance and mentorship on the Fellowship Assignment. In addition, high-level reviews of each Fellowship Assignment will be taken by the Hon’ble Chief Minister/Deputy Chief Minister every three months. Are there any circumstances under which GNCTD can terminate the Fellowship before 2 years? The Fellows will be on probation for the first three months, and only after successful completion of activities in the probation period, the Fellows will be allowed to continue for the full length of the Fellowship program of 1 or 2 years. A performance appraisal will be conducted at the end of the first year of the Fellowship program, if the performance is satisfactory, the Fellows may be made an offer to continue into the second year of the Program. What future career paths are open to fellows? Chief Minister’s Urban Leaders Fellowship program aims to provide skills related to organizational management, communication, problem-solving in an unstructured environment, people management and resourcefulness, which are valuable across all sectors. After completing the fellowship, candidates will have access to a plethora of opportunities in the policy and development sector. The fellowship will prepare professionals to contribute to public service. Furthermore, the experience will also prepare candidates for pursuing professional and academic opportunities in their domains. If I can’t apply to the fellowship now, can I apply at a later date? You may apply in the subsequent year during the same time period. Due to the time-sensitive nature of projects, selections are not made on a rolling basis. Failure to apply within the stipulated timeline will lead to cancellation of your application. In case, there is any change on this count, suitable notification will be given to the existing and new applicant pool. How many stages will the selection process comprise of? Round 1 – Online application: Candidates will be evaluated on the basis of their personal and professional qualifications. The essays are crucial for your application as they give you the opportunity to demonstrate why you are a strong candidate for the CMULF. Round 2 – Personal interview: The final selection will be on the basis of a personal interview with an expert panel where the candidates will be evaluated on the basis of overall abilities and specific job requirements. How can I save the application form? The online application is designed to work on your application in a structured manner. You can’t save sections of your application form. You have to fill each section one-by-one, complete it and submit it to move on to the next section. Please remember to click on the ‘Submit and Proceed’ section every time you move on to a new section. In the final section, click on the “Submit Application” button to conclude the application process. The Admissions Committee will NOT review your application while you are working on it. What are the application deadlines / timelines? The CMULF application will be available only on the website. The deadline for completion and submission of the application is 1st July 2016 by 11:59 pm IST. Late applications will not be reviewed. To avoid server traffic and potential delays, we encourage candidates to submit their applications as early as possible. Can I add new information after submitting my application if there is a required update? Once the application has been submitted, the Admissions Committee is unable to accept any changes or updates to the application. If invited to interview, the applicant may inform the Committee of updates at that time. Do I require original documents during the time of application? We do not require original documents at the time of the application. Please do not mail hard copies of your transcripts, certificates or mark sheets. However, if called for the interview, we will require you to carry your original documents with you. Can foreign nationals apply for the fellowship? Only Indian nationals, Persons of Indian Origin (PIO) and Overseas Citizens of India (OCI) are allowed to apply for the fellowship. Previous PostRecruitment of specialist officers in MMGS-II & SMGS-IV in Dena BankNext PostWION an upcoming Global English News channel a part of Zee Media Corporation is looking for Video Editors.